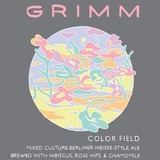 2019 Color Field is a Berliner brewed according to the traditional method, and infused with a trio of botanicals: rose hips, chamomile, and hibiscus. 2019 Color Field is a Berliner brewed according to the traditional method, and infused with a trio of botanicals: rose hips, chamomile, and hibiscus. The result is an incredibly refreshing, bone-dry, tart, earthy, funky, and floral beer that glows with a color we’ve never seen before. It pours a hazy pink color topped with fluffy pink foam.